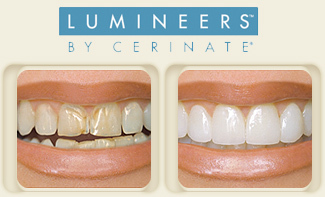 Lumineers is a brand of porcelain veneer that is made of cerinate Porcelain. Cerinate is exceptionally strong which allows the veneers to be made very thinly. In most cases they do not require tooth reduction, therefore there is no pain and/or the need for anesthesia (5 years warranty). Lumineers are indicated for stained, misaligned or teeth with spaces in-between. An impression is made and the mold is sent to the Cerinate Smile Design Studios where the LUMINEERS are crafted. On next dental visit, Dr. Nader Ahdout will try the LUMINEERS to ensure a good fit. The LUMINEERS are then bonded to natural teeth and set in place with a curing light. In only two easy dental visits, you will have a permanently whiter and beautiful smile without shots, drilling, or pain.